My Wavelength is a one skein project that could be whipped up for a gift or a colour popping accessory any time of the year. The perfect pattern to use with that posh hand dyed yarn you’ve got squirrelled away in your stash. Pattern includes full written instructions and stitch counts. 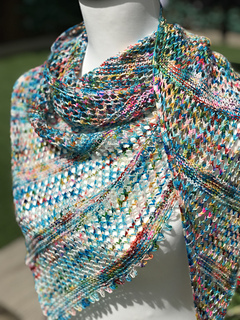 With its rhythmic eyelet and garter stripe pattern, this bias triangle shawl is worked from the narrowest point, with all the increases on the same side of each alternate row, finished with an optional picot bind off. 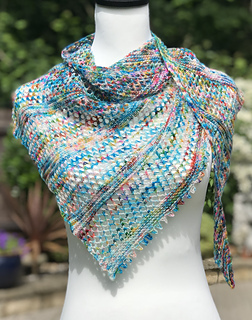 The pattern works well with a variegated or speckled yarn, but why not try it in a plain colour, or stash busting stripes. 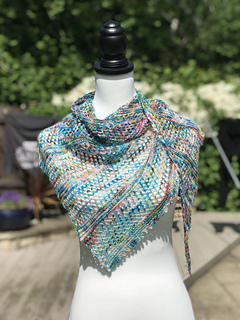 This shawl is so adaptable, it can be made using any weight yarn and any needle size, a pattern to be used over and over again.